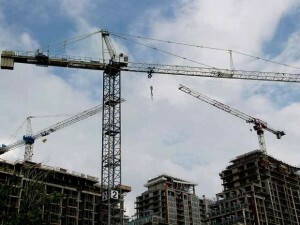 TORONTO — New home construction in Canada picked up in April, shaking off the effects of this year’s harsh winter, though economists still expect activity to cool gradually in 2014. The seasonally adjusted annualized rate of housing starts rose to 194,809 last month from 156,592 units in March, data from the Canada Mortgage and Housing Corp showed on Thursday. That surpassed analysts’ expectations for a gain to 175,000. March’s housing starts were revised slightly lower from the 156,823 reported initially. The volatile figure for multiple-dwelling urban starts surged 35.1% to 117,612 units, while single-detached urban starts rose 6.5% to 59,180 units. “A bounce-back in new home construction activity in April had been expected following the sharp outsized drop in the previous month that likely reflected the negative, though transitory, impact of lingering severe winter weather,” Laura Cooper, economist at RBC, wrote in a note. RBC forecasts starts will slow to an overall pace of 181,000 this year from 2013’s 188,000. Canada escaped the U.S. housing crash that accompanied the 2008-09 financial crisis, and home prices have risen sharply, if not steadily, over the past five years. Indeed, separate data on Thursday showed the price of new homes rose 0.2% in March, in line with expectations. While some economists have predicted the Canadian market will crash, most have said they expect sales and new construction to level off in 2014 and 2015 as mortgage rates rise, with prices continuing to tick slowly higher. “Looking through the recent volatility in housing starts shows that Canadian homebuilding activity is stable and running at levels supported by demographic demand,” BMO Capital Markets senior economist Robert Kavcic wrote in a note. Aside from weather disruptions and a spike in condo projects breaking ground in early 2012, starts have held within a stable 175,000 to 200,000 range since about the end of 2009, Kavcic said. Year-on-year, new-home prices nationwide were up 1.6%, data from Statistics Canada showed, within the 1 to 2% range registered over the previous year. Prices were unchanged in 11 of the 21 urban areas surveyed, up in five and down in five. Prices were flat in the Toronto-Oshawa region and in Montreal, while they fell by 0.1% and 0.2% in Vancouver and Victoria, respectively. The Canadian government, which has intervened in the mortgage market several times since 2008 to cool the sector, has long warned that the combination of high housing prices and heavily indebted Canadians could trigger widespread defaults in the case of an economic shock. But officials now expect the market to stabilize gradually. The new housing price index excludes condominiums, which the government has said have been a particular cause for concern.